Deepak Chopra’s central theme has always been, “Heal yourself.” In You Are the Universe, he adds another possibility — heal the planet. The Bodhi Tree’s mission was a home for the spiritually curious for 41 years. Now, in their own reincarnation, the world-famous book store/community is being reborn online, with a sacred mercantile to turn your home into a sanctuary, alongside the resident New Age books, woo-woo tarot readings, astrology, apothecary and healing crystals. On March 1, 2017, The Bodhi Tree held its first official off-site event since it closed its doors on New Year’s Eve in 2011 — a lecture and book-signing with Deepak Chopra. When I first arrived at the Skirball Center (in Los Angeles, California), I was a little worried for the renaissance of this beloved brand. It’s not easy to get to the Skirball Center in Los Angeles at 6:30 PM on a weekday. No amount of transcendence or meditation can part the sea of traffic. With only five minutes before Deepak was set to take the stage, the crowd was sparse — with not even 20% of the room filled. The warm-up entertainer, a singer/chanter, kept having his time extended, presumably to allow the late crowd to show up. I sat on my hands, holding my breath, and then exhaled, allowing myself to be coerced into singing along to the tune, “Smile” (made famous by Nat King Cole). When I looked up, the room was filled. After a brief introduction from The Bodhi Tree CEO Stephen Powers, Deepak Chopra took the stage to a sell-out crowd of 500 to discuss his new book, You Are The Universe. Deepak laughed as he remembered his first book signing at The Bodhi Tree, when only about 10 people showed up. (Clearly this was before his 1993 interview with Oprah.) That Wednesday night, audience members paid $45-$65 each to hear the wisdom and passion of their beloved author of 23 New York Times bestsellers. There was another thing that had me a bit worried. I love Deepak not only for his wisdom, but also for his poetic prose and ability to reduce complicated ideas into simple, actionable solutions. However, You Are the Universe reads more like a physics lecture. How would the lecture sound in person? The wisdom of the galaxies and stars has always befuddled me, so I felt comfort in learning that only 0.01% of the universe is actually visible. I didn’t completely comprehend how the magic of mirroring works — where two particles display complementary characteristics, even when separated by billions of light-years. But it struck me that I was witnessing a mirrored moment in real-time — how a book signing more than 20 years ago was intimately connected to this moment. How that gathering of ten in the early 1990s seeded the ground for 23 New York Times bestsellers and a sell-out crowd on March 1, 2017. Conscious choice — of The Bodhi Tree to host a relatively unknown author and of an unknown author to show up for just 10 people — can create these moments in the distant future, when complementary missions collide for health, healing and enlightenment, like stars lighting up the dark womb of the galaxies. In 1970, when The Bodhi Tree first opened its doors for the spiritually curious, Deepak Chopra was just arriving in the U.S. from India for his medical residency in internal medicine and endocrinology. The life expectancy in the U.S. was 70.8 years. The Jackson 5 song “ABC” hit number one on the Billboard charts. Today, people are living to 78.8 years of age, on average. Deepak Chopra, a long-time friend of Michael Jackson, looks vibrant and healthy, at the age of 70, like he is ready to live well past 100. He is living the dream of his teachings in consciousness, spiritual awakening and quantum healing. Sadly, Michael Jackson passed away at the age of 50 (June 25, 2009) from an overdose of prescription drugs. Consciousness opens up a future in which the planet can be saved from potential destruction. It puts the individual at the switch where choices change personal reality… For future generations, “You are the universe” will be a credo to live by, no longer a dream wrapped inside a mystery. The Bodhi Tree is the perfect platform for these messages, where the mysterious “unknowable” musings of the “Einsteins of consciousness” (as Deepak calls his teachers) are welcome. Is it my attitude that needs adjusting? Have I become too schooled by Tweets and the 5 Easy Ways to Climb Mt. Everest to dive into deeper, higher learning? Is You Are the Universe a koan? Is that why I feel so befuddled by the narrative, even though the central message flashes like a billboard in my brain? You Are the Universe had me at hello. In the title itself, I saw, “Consciousness opens up a future in which the planet can be saved from potential destruction.” I want to be in that tribe, mirroring a complementary, contagious and collective action of planetary renewal that will result in a healthy home for all for light-years to come. As fate would have it, I was there when Deepak Chopra starred at the renaissance of The Bodhi Tree and that monumental moment has a time-stamp on my heart. For me, that’s going to be a re-reading of You Are The Universe, a few more trips to BodhiTree.com and a renewed commitment to the ways that I can indeed become more in harmony with Mother Earth, celebrating sustainability with wisdom and action. You are the Universe, too. Join Deepak in an interstellar adventure. Buy the book at the reborn BodhiTree website. Support the bewildered and curious. The Bodhi Tree is an online destination for new and antiquarian book titles, as well as handcrafted sacred home and ceremonial products, consciously selected to support the thoughtful path. 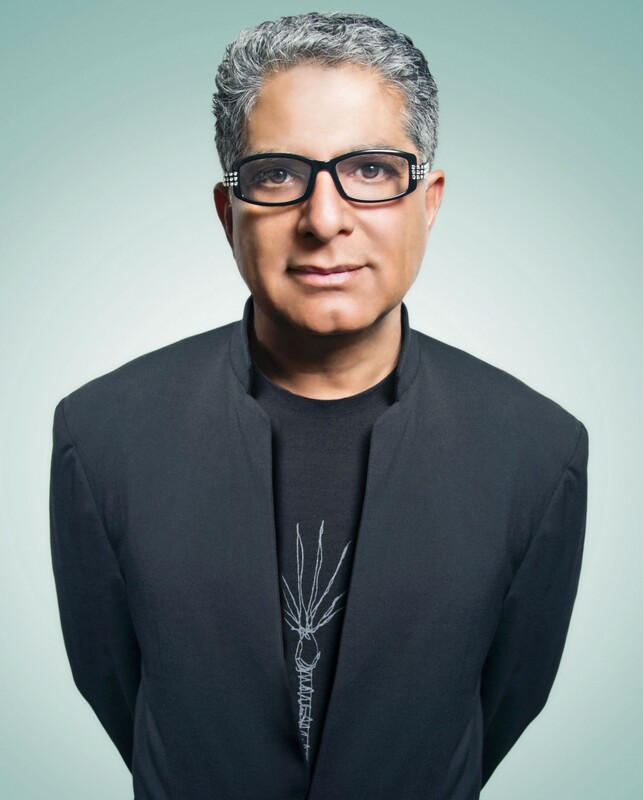 Deepak Chopra is a licensed physician, the founder of the Chopra Center (a center for health and well-being of body, mind and spirit) and the bestselling author of 23 New York Times bestsellers. Deepak encourages everyone to join the conversation on DiscoveringYourCosmicSelf.com and to download his JIYO app — your personal wellbeing companion. Sabbatical in India. The First 24 Hours.